Cowirrie make iOS apps. For examples, see our demonstrations page. This blog includes news about Cowirrie apps, travel and questions about data literacy. During the late 19th Century, railways were a vital economic and social link. They still took some time to spread across Tasmania, due to the inconvenient number of mountains and rivers. This is evident in the history of the North-Eastern Line, which opened from Launceston to Scottsdale in 1889, with extensions to Branxholm in 1911 and Herrick in 1919. 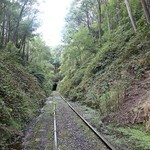 The North-Eastern Line included a rare feature: a 704-metre tunnel. 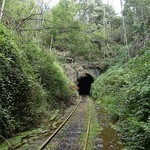 This was so unusual for Tasmania that the locality was named “Tunnel” and the nearby station was named “Tunnel Station”. With increased use of road vehicles, use of the North-Eastern Line slowed from the 1960s onwards and ended in 1992. 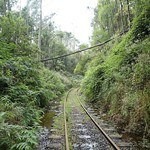 However, many sections of the old line may be walked. 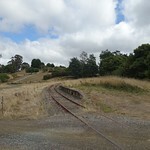 A 24 kilometre section of line from Tulendeena Station at Billycock Hill to Scottsdale opened in 2015. 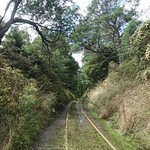 This was the North East Rail Trail, with plans to eventually cover the full length of the old North East Line for walkers, cyclists and horse riders. 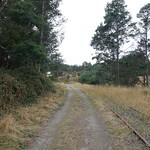 As of March 2017 North East Rail Trail work to replace tracks with gravel had not reached Tunnel, but the area was accessible to walkers who didn’t mind stepping between sleepers. The roads to the tunnel were helpfully named “Tunnel Road” (which passed over the top of the tunnel) and “Tunnel Station Road” (which led to the car park). Both were unsealed, with a combined length of 2.2 kilometres. 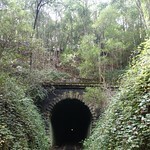 Tunnel Road began about 6.5 kilometres north of Lilydale, turning west off Golconda Road. Tunnel Station Road then turned south off Tunnel Road. Railway engineers considered the North East Line quite extreme, with gradients of 1 in 40. The tunnel section was not this steep, and for walkers simply felt flat. 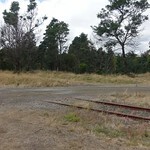 While the completed sections of the North East Rail Trail had replaced the sleepers and rails with gravel, the railway components were still in place along this part. These required some care to walk over, especially in the darkness of the tunnel. 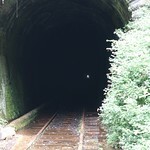 The tunnel was 35 chains (704 metres) long. 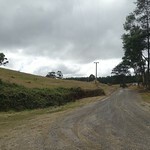 Work started on the approaches in December 1885. 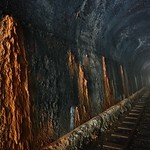 The tunnel was lined with a million bricks, placed in the course of 16 weeks. The construction work involved “at least 70 men” inside the tunnel, who completed the work without “the slightest hitch or accident”. 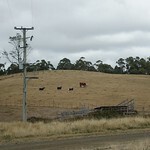 The walk along the railway line from Lebrina to Lilydale Falls had a nice grade and was an interesting route, mostly through farmland. You can probably persuade friends to drop you at Lebrina and explore Lilydale Falls while waiting for you to turn up. Walked 2.3 kilometres in 1 hour 4 minutes. 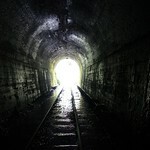 Walked through the entire tunnel and back again. 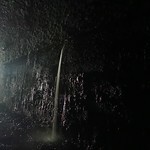 Dropped a hat into the mud while looking up at the tunnel roof. Otherwise enjoyed the walk. 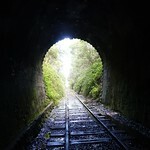 It was a fine day in a long dry spell, and the tunnel was not dripping overhead. 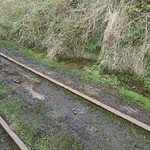 However, it was still very wet underfoot and walking was difficult between the rails, sleepers and mud so I turned back at. 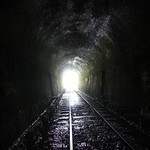 If you are a railway enthusiast, this tunnel may be worth a visit. 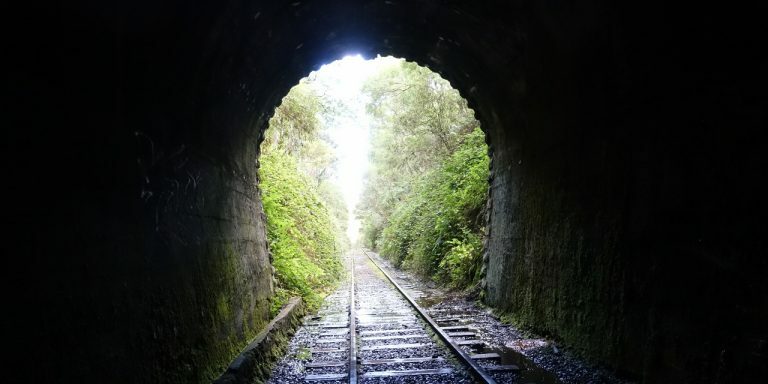 If you are a railway enthusiast with a particular interest in tunnels, this is the only tunnel you are likely to see in Tasmania. 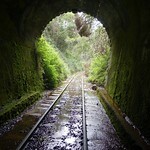 If you dislike dark and damp spaces, pretty much any other walk in Tasmania would be better than this one. 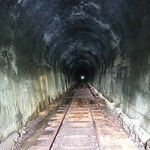 If you are planning a long walk along this part of the North-Eastern Line, you will need to go through the tunnel. Bring a torch. Yonge, John, 2004: Australian Railway Atlas, No. 1 – Tasmania. Quail Map Company, Exeter, UK. Your e-mail address will not be published or shared with third parties. First comments from new name/e-mail combinations will be held in moderation.